Most people agree that the kitchen is the most important room in a home, especially when they’re about to buy it! 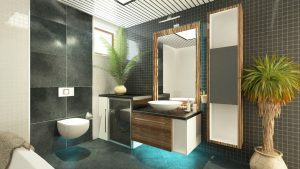 The bathroom, however, isn’t far behind, so if you’re about to go to market, you could do worse than to give your bathroom a quick makeover – if you lack any of these features, add them! Pretty much every bathroom has one now, so if you’re behind the curve, catch up! You can have freestanding ones, tall thin ones, curvy ones, bright red ones… Whatever you choose, make it stand out (this may mean lose the more threadbare towels for the viewing!) and attract buyers. This might sound a bit old-fashioned, but this bathroom accessory has moved on a bit. You can get some really eye-catching and stylish models for not a great deal of money and if you can find one that doubles up as a bathroom seat, then you’re onto a winner. Yes, really. Let’s forget all about the peach-coloured, suckered rubber horrors that haunted your gran’s littlest room. Soap dishes are a new breed now – metal, glass, marble, slate… Whatever you fancy, you can keep your soap on it and add a nice touch to your bathroom. So simple but so effective, hand towel rings don’t cost the earth and they’re easy to install. They also give your bathroom that hotel sort of feeling and you can choose one that matches your overall style. Again, move on from the chipped metal mug or limescale-encrusted glass already. You can find all kinds of holders now, from humorous to urban, classical to abstract, or simple and minimalist. Whatever you decide to put in your bathroom, you should aim for a hotel-like look and feel. Above all, make sure you keep on top of the limescale and soap deposits, especially if you have chrome, mirrors and any other shiny surfaces – think bathroom-bling if you want to sell.